Drake visited the U.K. on Sunday, performing with both Giggs and Boy Better Know across two live shows. First up, in the afternoon, the rapper appeared during Giggs's set at Reading Festival. Giggs spoke to fans before the cameo, thanking them for staying with him throughout his career and saying he had a "friend" to perform with him. Drake then sprinted out as the opening of More Life favorite "KMT" played, causing the DJ to wheel the track almost immediately. Sunday night, meanwhile, saw Skepta and the rest of his BBK crew headline their own all-day festival at London's O2 Arena. 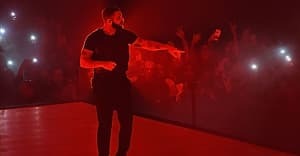 Following a day of live music that included sets from J Hus and MHD among others, BBK were joined by Drake for another cameo appearance. Naturally, the crowd's excitement levels were sky high on both occasions. Check out footage from both shows below.